By the beach you can find a large, overflowed sea water, swimming pool constantly refreshed and cleansed. Plenty of sunshades and deck-chairs are available (free of charge), showers, toilets are adjacent. The pool bar offers drinks and snacks throughout the day. 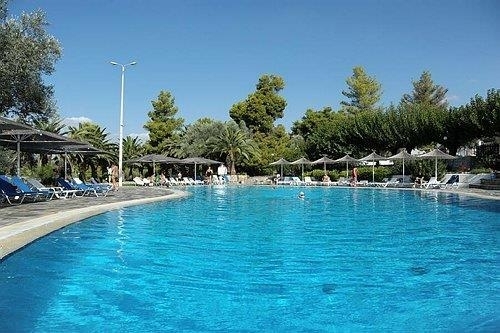 The sea water swimming pool along with all the surrounding facilities define the most active part of the resort starting from early in the morning till late at night. Our in-house animation team is organising different activities both in the pool and also in the surrounding areas. The Fresh water swimming pool, an aquatic paradise of fresh water pools with an exotic isle in the middle comprising various sizes and depths covering an area of 1.107 sq m complemented by a four-lane 25 m long pool. The 600 sq m of the fresh water swimming pool is between 40 and 60cm depth ideal for children to swim and play. Plenty of sunshades and deck chairs are available (free of charge), showers and toilets are adjacent. The Kamares coffee shop is located alongside the pool and is ready to offer its service of drinks and snacks throughout the day.